The Big Sister was away at Brownie Camp over the weekend, leaving me worrying ( needlessly) about her falling in when canoing, waking up in the night and missing home etc and My Little Helper with nobody to argue with. So it was fairly peaceful. The 'Butteroons' tins will be great for buttons and braids (as part of the ongoing getting organised in the craft room programme! 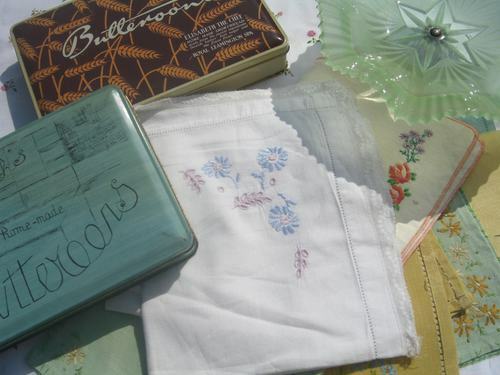 ), I love the Eau de Nil green of the cake stand and how could I leave the embroidered tray cloths behind? Only 2 quid for the lot, I love a bargain. My husband also spent £2...on a scalextric for My Little Helper to play with.....yeah right! 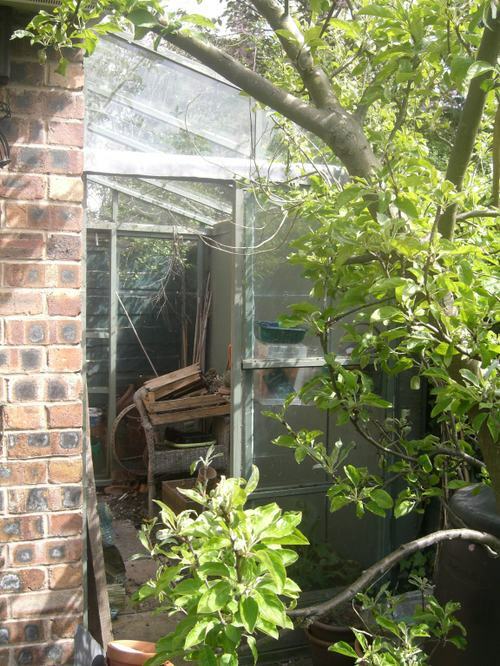 I have a little custom made greenhouse, which is of course painted green. My ingenious husband built it between a brick workshop at the end of the garden and the fence. It gets just enough sun to encourage the tomatoes and aubergines to grow. 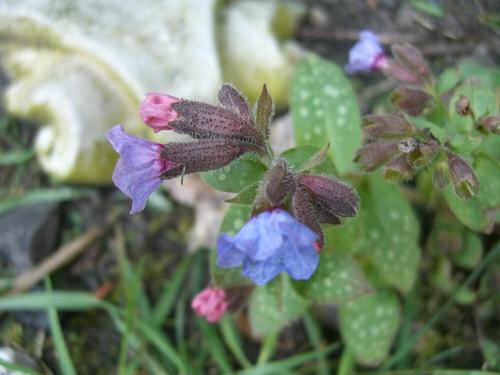 I have been reading Dustpan Alley about Angelina's hard work in the garden and also My Messy Thrilling Life where Brin has been making a patio then finally Posy who has the most wonderful garden, all of which chivvied me out there myself to get started. 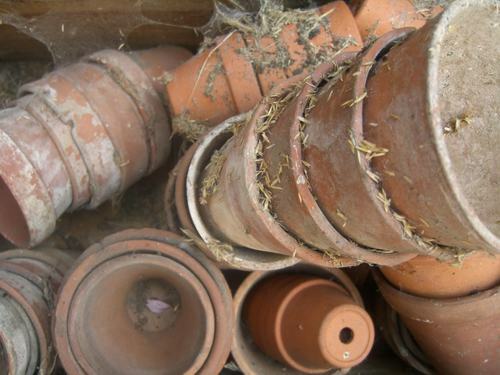 I've been sorting out the green house first, moving all the old flower pots out, digging the soil over and hardening off the runner beans ready for planting out. Outside I'm going to grow rocket in an old Belfast sink and some courgettes in pots too as there's not enough room for a proper veg patch. I've got dirty finger nails and an aching back and have had a lovely day. Tomorrow the flower beds will get some much needed attention and I'm going to spend the garden centre gift vouchers that I was given for my birthday...in August! I fancy columbines, poached egg plant, foxgloves, more lavender and rosemary and definitely hollyhocks. Thanks for your input on the music front, glad to know so many other people are '80s music fans! I'm going to buy someone new but still haven't decided who, perhaps Amy Winehouse, the Dixie Chicks, I don't know why but it seems harder to choose when it's not going to cost me anything! My CD changer in the car has broken, several cd's got stuck in it and wouldn't come out. At the garage the 12 year old who served my ( ok he was slightly older than that, but not much) looked at me as if I'd come out of the Ark when I mentioned the names of the artists trapped in the player! The player has to be sent away and I might not get the cd's back so I can buy 4 new ones and the garage will reimburse me. Hence the point of this post as I never buy cd's and grew up in the '80s... Spandau Ballet, Annie Lennox, Joe Jackson, Culture Club, The Cure.....and never really moved on from there..oh the shame! So who is good, hip and someone I should be listen to now?? The most recent cd's I've bought are Nora Jones, Madeline Peyroux and Jools Holland but that was probably 18 months ago! Firstly thank you for all the good wrist wishes, it's been strapped up and is feeling much better. I thought that as it had been busy all week carrying groceries, library books and children it might as well brave the sewing machine today. I like how it turned out, the top edge is a bit wonky and it reminded me that for some projects it is better to measure and cut accurately as the lining nearly didn't fit. I put a little pocket inside to keep my chocolate phone in then sewed on the yo yos by hand. 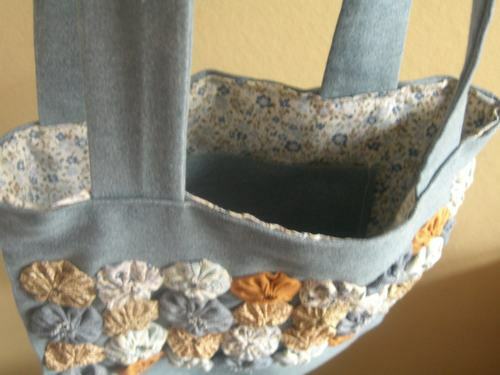 My new Spring bag. I bought some dark brown linen from the fabric shop when I got this demin so might make another, with my tape measure to make sure it fits together as I don't think the handbag angels would smile on me twice and make it work even though nothing was measured! I have discovered that, unsurprisingly, once one hand is out of action creative opportunities are decreased. Somehow I've damaged a ligament in my left wrist, probably opening a bottle of wine! Actually the lump and the swelling just appeared and it started hurting, but as the support bandage is inspiring The Big Sister to help around the house and do lots of little jobs for me I'm planning on leaving it on for ages. 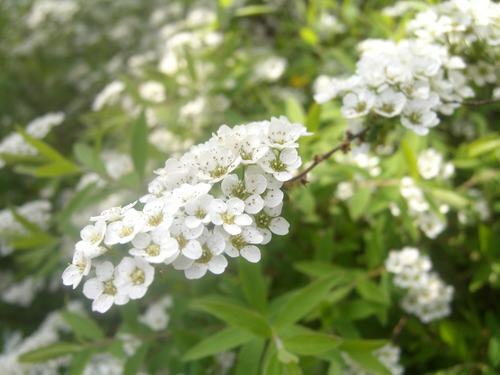 I'm not sure of the name of the white shrub, the flowers are very pretty but sadly it smells of dog wee! I felt like making yo-yos again, in blues and browns, one of my favorite colour combinations. 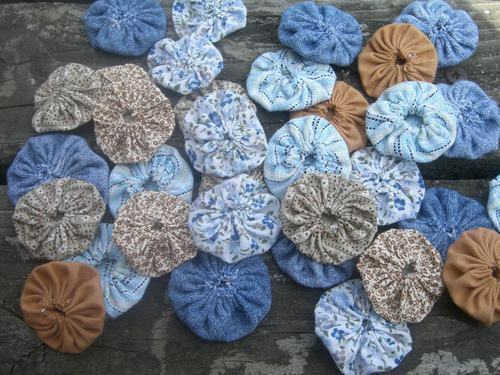 Just small ones, a bit of hand sewing to do in the garden in the sunshine. When I started I didn't have a particular use in mind, but now I'm thinking of a bag. 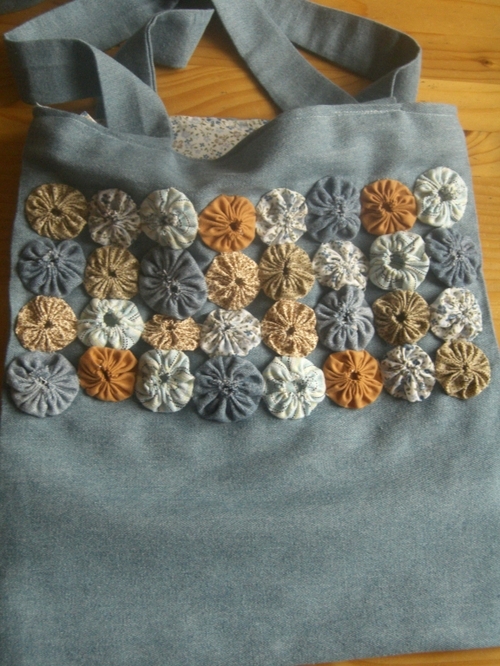 A floppy denim tote, with longish straps so I can carry it on my shoulder, to hold a magazine, suntan lotion and sunglasses whilst I pretend I don't need to cart all the children's things around! If I can work out how to line it I'll use the fabric with the little blue flowers, which used to be someone's sun dress before I rescued it at a jumble sale. 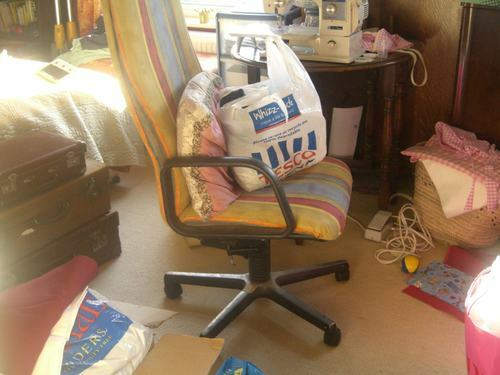 I have been look at some of the wonder work room that people have - bright, airy, organised and inspiring spaces. Like Heather Bailey or Yvestown or Blossom Hill Cottons. How creative could you be in a room like that? The best corner of my workroom that I can show you is this. 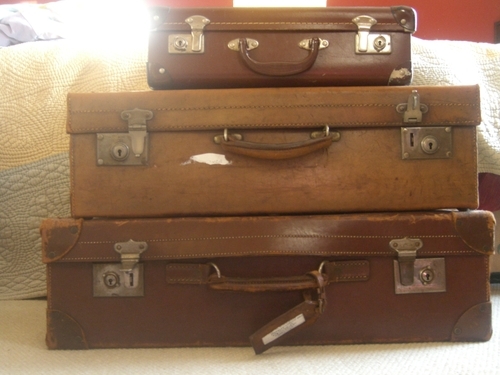 My Grandparents old suitcases that I use for storage. They have stood the test of time and are still sturdy and a little lived in. Unlike the suitcases I bought last year which already have broken zips and gouges out of the sides, but that's another story. My space is actually in a large, bright room, but it doubles as a guest room, library and general dumping area. The floor is covered in bags and boxes, stuff is piled everywhere, all the shelves are over flowing. There is hardly any floor space for cutting out let alone table space. The machine perches on a little gate leg table and I perch on an old office chair. What is it about the arrival of Spring and sunshine that makes you want to sort out, tidy, clean, refresh, redo and renew? It will be a big project I think as I'd like to paint the walls a more restful shade, move the open shelving to the other end of the room and hang muslin curtains in front, rearrange all the furniture and sort out proper storage for my stash.Humm perhaps I should aim to have it done by Christmas!? The room reflects my mind I think, cluttered, tired and in need of an overhaul! We have been enjoying lazy days in the garden with this wonderful sunshine, eating outside, lounging about, gardening, doing gymnastics, scooting and swinging - me mostly lazing, the children the rest! 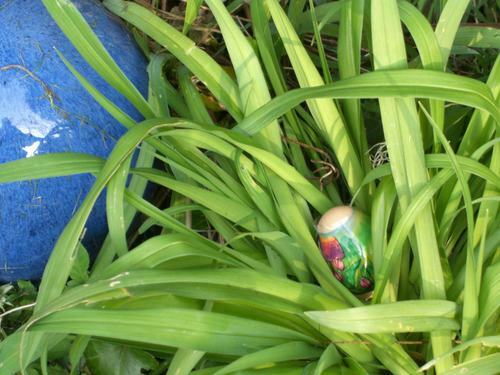 We had an Egg Hunt for the eggs left by the Easter Bunny which was hugely enjoyed by My Little Helper and The Big Sister, it also made me notice how many more plants were awakening. 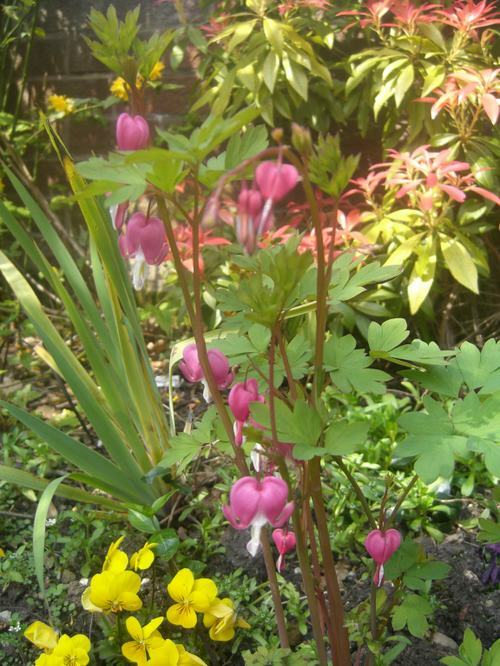 Both the pink and the white Dicentra are in flower, as are the Red, White and Blues, Kerria and Violas. Egg sandwiches for lunch anyone?? Oh no we're too full of chocolate! 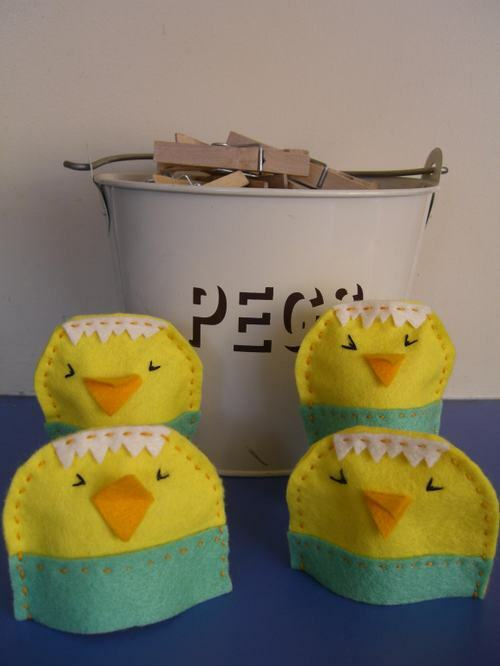 A little clutch of egg cosies! Thank you all for the kind comments on my grumbling post,they really cheered me up. So last week had an extra surprise in store for me on Friday - I lost a filling which is only a big problem as I don't have a dentist. My dentist went private a few years ago and after 20 years as a patient I suddenly found myself without dental care. There are no dentists in my area taking people on so I spent Friday morning on the phone trying to find one who would take pity on me and fix my tooth. So new week, new attitude! Stop complaining about congested head and do menthol steam inhalation and take more echinacea. Look forward to chewing again once tooth has been fixed tomorrow. Deliver the t shirt and baking bag orders that I've made this weekend. 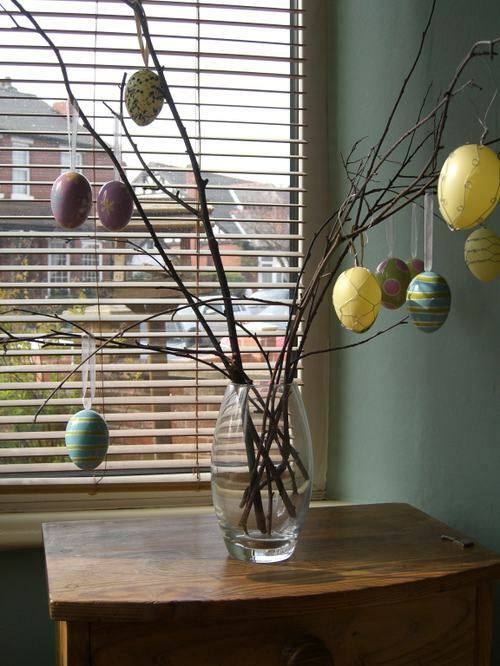 Enjoy the sunshine with the children now that they are on Easter Hols.